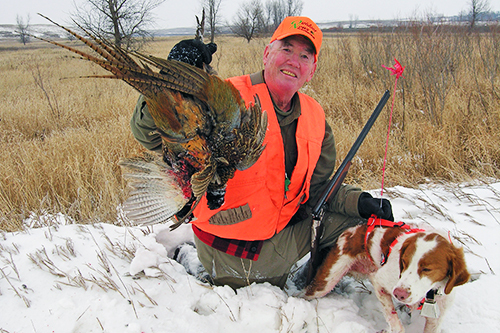 Gary Clancy loved upland bird hunting, and he had several great dogs that accompanied him on his southern Minnesota excursions. The antics of his canines frequently qualified as quality fodder for his Outdoor News columns. Gary Clancy passed away on Wednesday afternoon, July 27. The author wrote this note to him last week when he learned the longtime Outdoor News contributor had entered hospice care. Spoke with Nancy on Friday about your condition, and I wanted to share some thoughts with you. I hope you can read this or perhaps Nancy or one of your daughters can read it with you. I had the pleasure of meeting you during a writers hunt down in Texas – probably around 1995. Through my position at Bowhunting World magazine, we’d likely chatted a few times, but that’s where we first shook hands. It was an honor to meet you then, and it’s been an honor to know you every day since. One evening in Texas, I recall you sharing a hilarious story about climbing up on stage during a USO show in Vietnam and singing with other GIs. From that first experience with you, Gary, and all the years I’ve known you since, I’ve appreciated your big personality and small ego. You’ve always been approachable and down-to-earth, which is probably why your writing has been so popular. We chatted some more in the Fort Worth airport en route home, and you lamented devoting a whole day to traveling. Sitting in airports is challenging for guys who want to be afield. For two decades, it’s been an honor reading your columns before anyone else! I take credit for nothing other than encouraging you to write about your Vietnam experiences. As you know, my dad was a Marine over there for 13 months from 1967-68, during Tet, and I always felt like Vietnam veterans didn’t receive proper credit for their sacrifices. Plus, your in-country pieces were just good, old-fashioned quality reading. Looking back at my tenure here at the newspaper, those stories you wrote about your days touring Indochina are some of my favorites. And that column you wrote spanking Jesse Ventura for his “hunting man” quote still remains the definitive statement on that incident as far as I’m concerned. 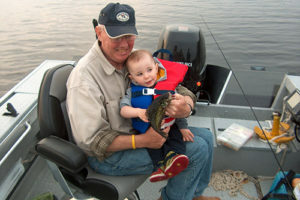 Dedicated readers know how much Clancy loved his grandchildren and enjoyed teaching them about hunting and fishing. Over the years, you always encouraged me to buy my kids a dog, and I’m finally accomplishing that this fall. Truth be told, Annette and I almost began the process six years ago, but then we discovered a “trophy baby” had stowed away from our fall vacation of 2010. Getting a little sister was pretty cool for our boys, but they – and now Miss Elisabeth, too – haven’t given up on a hound, and I’m on board. We have reserved a golden retriever pup from a breeder that Tom Dokken and Chuck Delaney both recommended. Should be a good family dog, and versatile enough to hunt ducks, pheasants, grouse, whatever. We’re all pretty excited, and I’m hoping the presence of a quality canine companion forces me afield more frequently. I want my boys and daughter to experience the great pheasant hunting you shared with your family. You’ve set a tremendous example for me, and countless others, Gary, on being a good man. 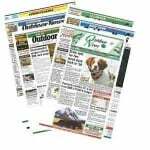 Son, husband, father, grandfather, son-in-law… all those relationships have formed the core of your writing in Outdoor News. Done correctly, there’s effort, pain, and sacrifice in building and then holding together a family. All of humanity shares the ups and downs, the trials of surviving on this rock steering through space, but you’ve exposed the sheer joy of raising a multi-generational family in the outdoors. The personal gratification you’ve drawn from your commitment to that lifestyle has resonated with every person who’s ever seen you walking a CRP field or read your column. And we’re better hunters and anglers, too. Think of all the walleyes that could be dumbly swimming through Minnesota lakes, or the whitetails stumbling about the forests, if not for your efforts in creating more efficient hunters and fishermen! For decades, your words have blessed the region’s palettes with hundreds of thousands of wild game and fish meals. I’m a better deer hunter, and I’ll be a much better dog owner, thanks to your advice. So many outdoors writers have something to prove when they pen a piece, and that attitude too often seethes through the magazine paper. Never with you. You’ve always been comfortable in your own skin, and readers trusted your advice as a result. Outdoor News will never replace your voice, Gary, but the experiences and expertise you’ve uncovered will live in the memories of millions of people. Your stories have been a tangible, full-sensory snapshot and vivid history of the Minnesota outdoors scene over the past 60-plus years, and future outdoorsmen will be reading them for decades, or longer. You’re an indelible link to the classic American outdoors scribes of yore, the first Minnesota fish fries, the first mammoth hunters, and the first man who tamed a wolf. It’s been an honor knowing you as a professional colleague and a friend. I treasure every conversation and experience we ever shared. God bless you and your entire family.